Shop for nail supplies and get rewarded. Here at Allure Nail Supply, we have created our loyalty program with exciting and exclusive rewards to say 'thank you' to our amazing customers. Get points on your birthday! Refer a friend and get $10 OFF coupon for every successful referral. How do I join the Allure Rewards Program? Simply sign up at www.allurenailsupply.com our store caters to licensed nail technicians, we'll be requesting for your License Number. How much do I need to spend to get rewards? Our store requires $25 minimum spend, but to claim points, you must spend $25 on your purchase, before taxes and shipping. Allure Rewards is only applicable for web orders. 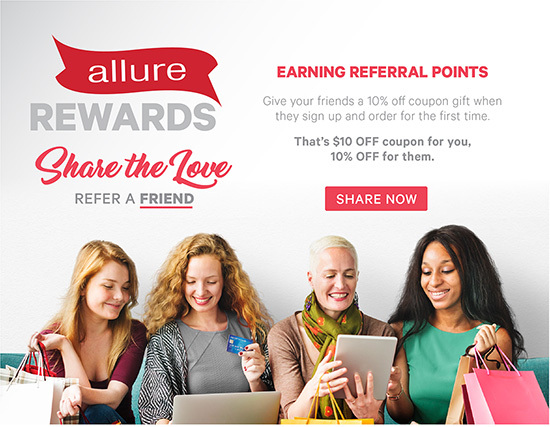 Allure Rewards is automatically created when you sign up with www.AllureNailSupply.com Points are good on next purchase. Purchase requirement of $25 must be met in a single transaction, before taxes and shipping, and after discounts. Allure Rewards points are non-transferable or exchangeable to cash. Allure Rewards points will not be refunded for any cancelled order. When shopping with Allure Rewards points, apply coupon code on your checkout to use discount or corresponding dollar amount of points. When calculating the amount of points earned, shipping fees, taxes are excluded. Allure Rewards points are only given once your order has been shipped and completed. Allure Nail Supply reserves the right to alter or make changes to the Terms & Conditions/Rewards Program at any time without prior notice or liability.